Equus Promises made, promuises kept" could be Hyundai's motto if they wanted it. They told all of us they were headed upscale with their new models, and now they've unveiled the Equus, an ultraluxurious sedan that is likely to give luxury car makers everywhere some massive headaches this sales season. It's based on the same rear wheel drive architecture that Hyundai uses for Genesis Coupe and Sedan. Power for the Equus comes from a 385 horsepower, 4.6-liter Tau V8 engine, a two-time Ward’s 10 Best Engine winner, mated to a ZF 6-speed automatic transmission with SHIFTRONIC® manual control. The Tau V8 delivers an estimated 385 horsepower and 333 lb-ft of torque (378 horsepower and 324 lb-ft using regular fuel) to fit the demands of luxury consumers. Hyundai says the powertrain combination will move Equus to 60 miles per hour in less than 6.4 seconds. 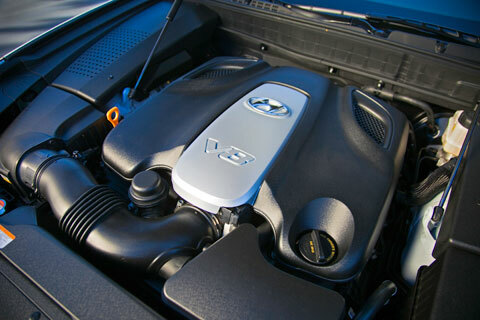 On premium fuel, the Tau V8 produces more horsepower than the powerplants found in the Lexus LS460, Mercedes-Benz S550, and Audi A8 and nearly the same power as these competitors on regular fuel, the company adds. Though it doesn't break any new styling ground--that's hard to do given the large number of brands and models these days-- the Equus still is a good-looking, athletic design that looks a bit more contemporary than some of its competitors. The rear end of the design features fully-integrated asymmetrical exhaust tips and rear LED turn signal indicators. Around front, a company news release says, is "a subtle horizontal radiator grille and well-proportioned headlamps with jeweled detailing. LED turn signals are inside the HID headlamps along with an adaptive front lighting system with white LED position lamps. The lower air intakes are bold and add to the positive reaction of the overall design. To assist in parking, and navigating blind corners and alleys in urban driving, there is an optional forward-view cornering camera integrated into the grille." The interior is a beautiful design with leather upholstery, Alcantara® headliner, natural wood trim and leather-wrapped French-stitched instrument panel. 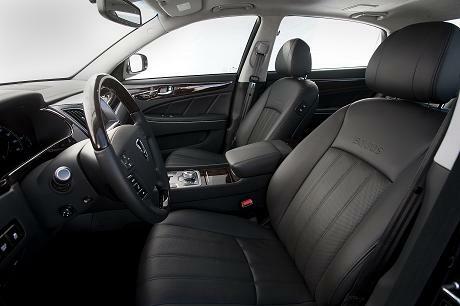 The seats are designed with adjustable driver thigh support and heated and cooled functionality. Thermoelectric devices located in the seat backs and bottom cushions provide control for heating, cooling and humidity. There is ample leg and head room for drivers over six-feet tall and an optional massaging driver seat. 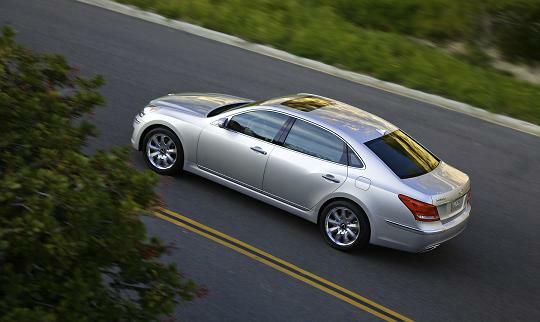 Hyundai says that the Equus has more leg, head and shoulder room in the front and rear seats than the Lexus LS460. Meanwhile, the driver’s cockpit boasts an abundance of features and premium services, including the dribver information system (DIS) provides navigation, XM Satellite Radio, HD Radio technology, hands-free Bluetooth telephone system and much more. Equus sedans are equipped with an electronically controlled air suspension, and if you want a bnit more stiffness and responsiveness, you can use a sport setting that also comes with additional body control. Like things soft and soothing? Then use the normal setting on the system. Of course, Hyundai is known for being ahead of the game when it comes to equipping its cars well for safety, and Equus will be no exceptyion. The long list of standard safety equ8ipmaent includes Electronic Stability Control (ESC), nine airbags, electronic active head restraints, lane departure warning system and smart cruise control. Equus also has a Vehicle Stability Management system (VSM) that optimally manages ESC, the electronic parking brake, smart cruise control and the seatbelt tensioning system for optimal safety. Equus' total of nine airbags include advanced dual front airbags, front and rear seat-mounted side-impact airbags, roof-mounted side curtain airbags for both front and rear outboard seat occupants and a driver’s knee airbag. Hyundai’s lane departure warning system offers a warning light and chime after a one- second lane departure, and adds a haptic warning via the seatbelt after a three second lane departure. Smart cruise control automatically manages the Equus’ speed through the braking and throttle systems to maintain a specified following distance selected by the driver. The electronic parking brake with automatic vehicle hold enables the parking brake to hold the vehicle automatically when the vehicle stops, and deactivates as soon as the gas pedal is pressed. Equus has an optional camera located on the front grille and a standard camera on the rear decklid. These cameras help detect how close objects are when parking. Distance is indicated on the in-dash LCD monitor. Equus will use a Lexicon surround sound audio system includes a 13-channel digital amplifier and 17 speakers producing 608 watts of sound in 7.1 discrete surround sound audio. 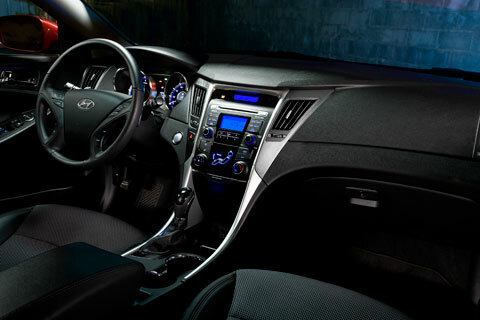 Equus also offers the clarity of digital HD Radio technology, XM Satellite Radio and iPod®/USB integration. You can expect prices in the mid 50s. Sonata Has Hyundai joined the go fast crowd? As far as we're concerned, they joined that group with the sporty Genesis Coupe, which can give a lot of cars a run for the money--and a quick one at that. 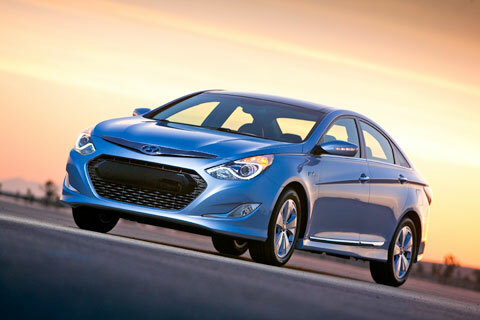 But now Hyundai has reinforced its fast car club membership with the introduction of a Sonata equipped with a 2.0-liter Theta II turbocharged gasoline direct-injection (GDI) engine. The 274 horsepower engine still gets around 34 miles per gallon on the highway. There's more good news for Sonata fans. There's now a Hybrid Sonata, and you'll be able to distinguish it from the other Sonatas by its futuristic looking front end. 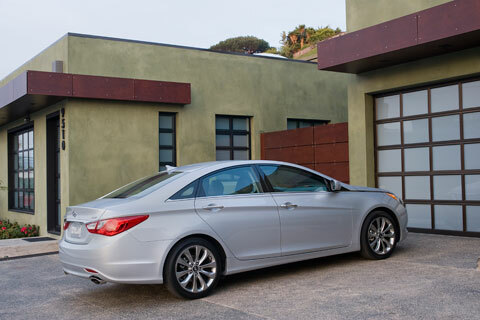 “The Hyundai Sonata Hybrid is the new kid on the block, but it’s not a follower,” says John Krafcik, president and CEO, Hyundai Motor America. “Its full parallel hybrid configuration and breakthough lithium polymer batteries offer a new take on traditional hybrid design, while its unique design sets it apart from the mid-size hybrid pack.” According to a Hyundai news release, the Hyundai-developed Hybrid Blue Drive architecture is a full parallel hybrid drive system, which can operate on an electric motor, gasoline internal combustion engine, and a combination of the two depending on driving conditions and driver demands. Hyundai’s proprietary full parallel architecture differs from the power split technology used by most competitors, allowing significant efficiency advantages at higher speeds. "Hyundai Hybrid Blue Drive is the first and only system using lithium polymer battery technology – leapfrogging competitive in-market nickel-metal hydride and lithium-ion applications," the news release says. " Lithium polymer offers the benefits of lithium-ion, a technology used in laptops and cell phones, but adds robustness, power-density and package flexibility, making it ideal for automotive applications." Hyundai says consumers can expect 39 miles per gallon on the highway and 37 in city driving from the Sonata Hybrid.